We've had some rough weather over the last week or so here in the UK: blizzards, icy blasts, power lines down, road blockages, torrential rain and so on. 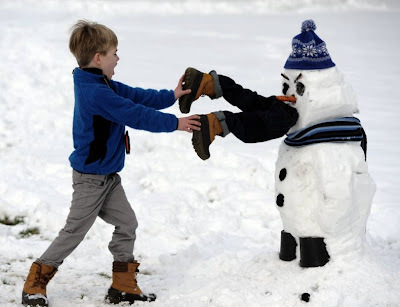 Things have got so bad that even the snowmen are getting hungry and have started devouring small children. The Prime Minister is taking steps to stamp out this sort of unacceptable behaviour, and appropriate legislation will be going through parliament this summer and should be in place by 2016. Thank goodness we have a Prime Minister who gets things done. What's that? What about: Finance, Immigration, Hospitals, Banks, Welfare, UK Debt, Unemployment, the EU? Let's get the priorities right. 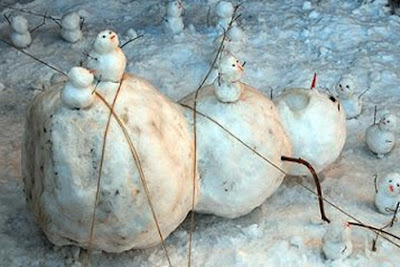 The PM often assures us of 'what the public wants' and top of the list must therefore be the abolishment of snowman eating our young. As he keeps telling us: "We are all in this together." The Liberal Party may well vote against the Prime Minister's proposed legislation. Deputy Prime Minister, Mr Clegg, wondered what the Prime Minister really has on his mind and said, "Is he simply white washing over the real issues? Snowmen have rights too. I hope we don't see people taking the matter into their own hands." As for the opposition Labour Party they completely oppose any legislation. They confirm over and over that when they were in power for 13 years not one child was devoured by a snowman. It's the Conservative government who have got us into this mess. "all current videos today" should read "all current videos down today" in the above comment. A happy day to you too - is that really the date? What a coincidence! This is a serious matter and nothing to laugh about!